Château Olivier has a wonderful old stone chateau with turrets and a moat which dates back to the 12th century, making it one of Bordeaux’s oldest properties. This estate makes good wines in a traditional style. Vineyard/Terroir: 52 hectares in a single block with Guntz gravel and clay-limestone soils. Planted with 50% Cabernet Sauvignon, 40% Merlot and 10% Cabernet Franc for the reds and 50% Sauvignon Blanc, 45% Sémillon and 5% Muscadelle for the whites. Bunch and leaf thinning practiced in the vineyard and sorting. Winemaking/Elévage: Temperature controlled with barrel ageing for the reds and whites. 2010 Deeply coloured; dark centre; some spices, less expressive initially; some liquorice and menthol notes; depth apparent; palate feels a little chunky [by comparison with La Mission immediately before]; but plenty of depth and material here; lots of clean blackcurrant fruit on the palate; ripe tannins but present and perhaps a certain chunkiness here. Drink 2018-2030. 90 MW Institute Nov ’14 [Earlier note] Mid depth; some freshness, little chalk and wet rock; blackcurrant, some olive, lots of extract on the palate; little one dimensional though fresh and chewy. 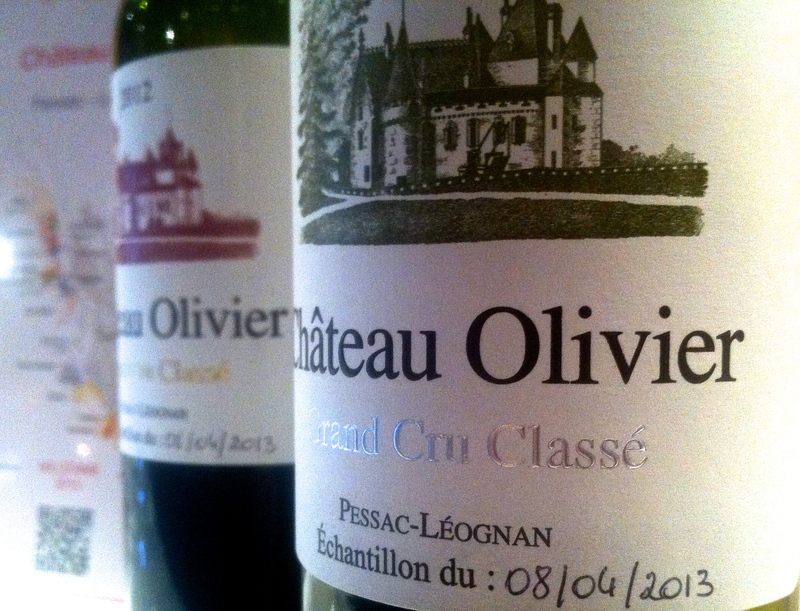 Both the red and the white at Olivier disappointing in this otherwise fab year for Pessac-Leognan. Were much more promising during primeurs. 87 UGC Oct ’12 [Earlier] Deep and arterial; smoky blackcurrants, very deep, plush and lush, creamy too; lush sweet entry, plump but with structure. Ripeness. Very well handled. Quite terrific effort. 92-94+ [60% Cabernet Sauvignon, 40% Merlot] Tasted 6 April 2011 UGC. 2009 Mid depth; fresh, mineral, density; some cassis and blackcurrants but more minerals; dense and tannic [ripe] old fashioned but this works. Traditional and grippy. 90+/100 MW Institute Nov ’13 [Earlier] Concentrated, fresh, healthy colour; little high toned, nicely perfumed; some violets and raspberries alongside some stalky components; palate sweet entry, concentrated and layered palate; this should work and come together. Big and tannic. 90+/100 [50% Cabernet Sauvignon, 50% Merlot]. Tasted 31st March 2010.